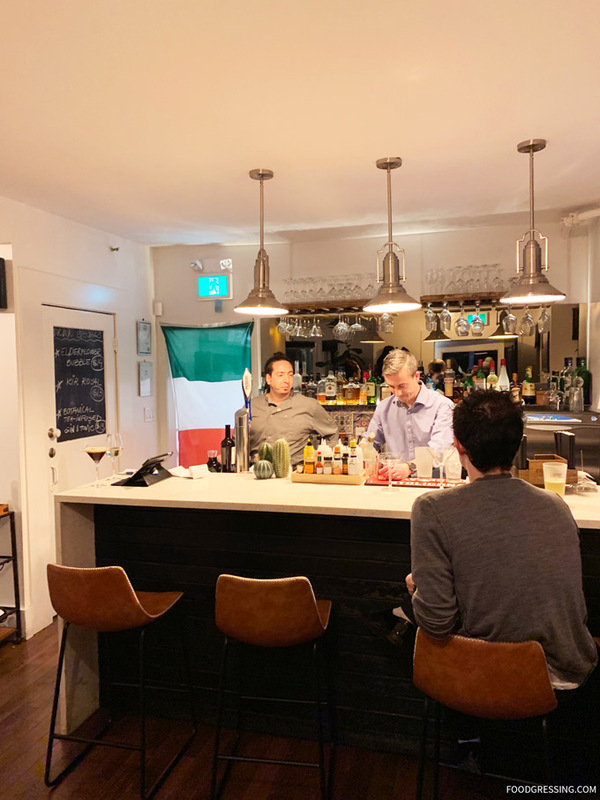 Newly opened in Mount Pleasant is Mangia Cucina, a cozy, casual Italian restaurant located inside converted heritage house. 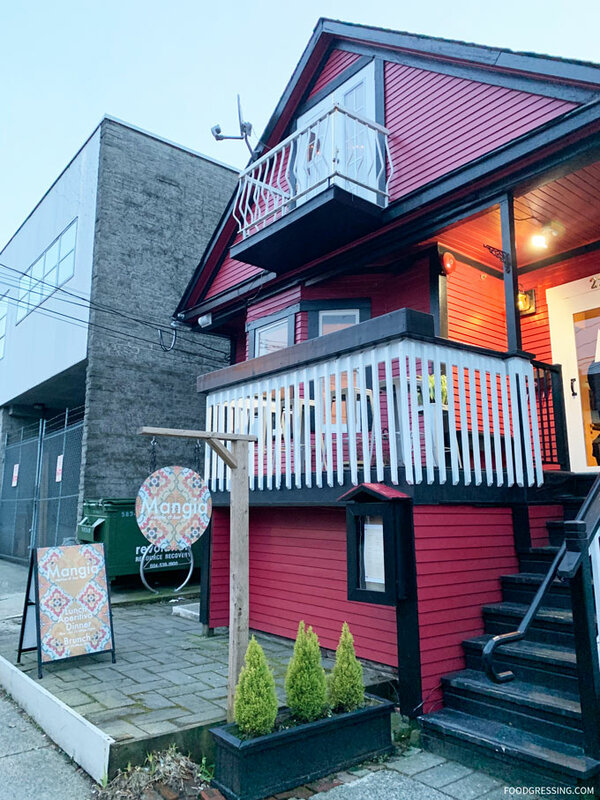 The restaurant opened in October 2018 and is chef-owned and operated by Sicilian-born Chef Alessandro Riccobono (formerly of Trafalgar’s Bistro in Kitsilano). The restaurant is open for lunch (11:30 am – 3 pm) and dinner (5 pm – 10 pm). The dinner menu is divided into Italian antipasto, salads, pasta, risotto and pizza dishes. For the antipasto, there are meat (like homemade meatballs), vegetarian (like cornmeal fritters) and seafood (like deep fried calamari) options for the antipasto. Salad options are $12 – $15. For pasta, they offer dishes like spaghetti carbonara, lobster ravioli, ricotta spinach crepe rolls and so forth ($18 – $23). Risotto choices (like seafood, mushrooms, proscuitto) are $17 – $23. Pizzas include red and white sauce offerings ($16 – $20) and range from classics like margherita, quattro formagi to pistacchio e mortadella (mozza, pistachio pesto, mortadello). My friend Kristina and I decided to visit Mangia on a weekday night for dinner. She’s Italian and a lover of Italian foods so I love trying out Italian restaurants with her. We came in right when the restaurant opened with a reservation and fortunately we got a table as the place quickly filled up. The interior is small and quaint and does make you feel like you are in someone’s home. There’s a mix of dining tables for two, banquette seating and a few seats at the bar. 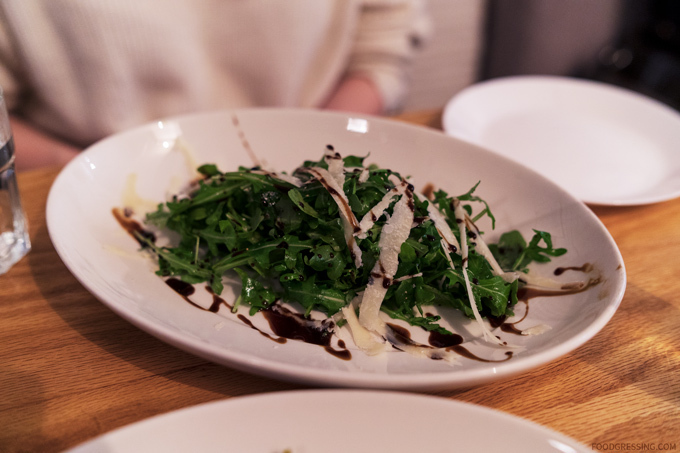 We started off with a lightly tossed and refreshing insalata di rucola ($13) with arugula, shaved parmesan and balsamic reduction. 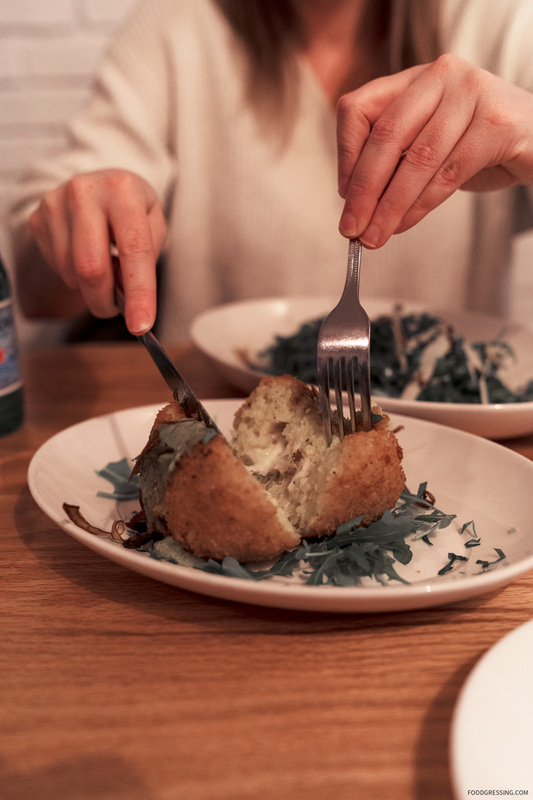 Next came the arancina bomba ($11), a hearty saffron risotto ball stuffed with mozzarella and served with pisacchio pesto. 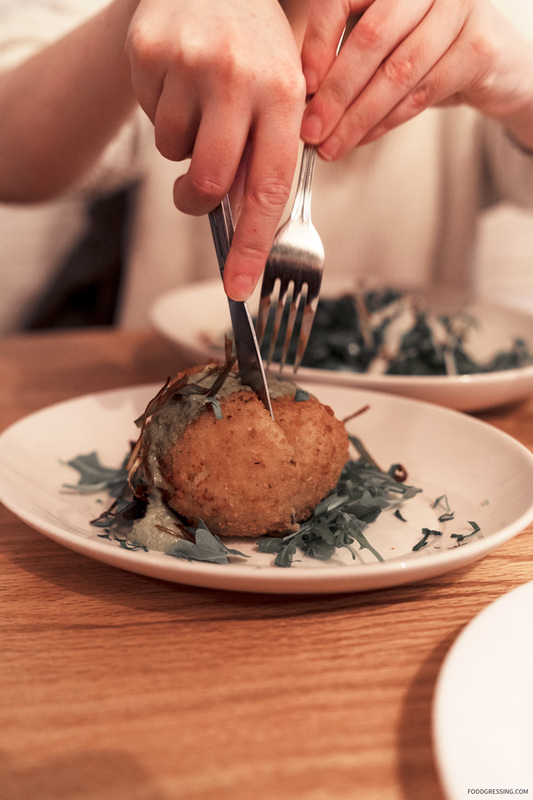 The dish was presented as a single ball so we divided it between the two of us. The inside was hot but still edible and I really like the creamy, risotto filling. 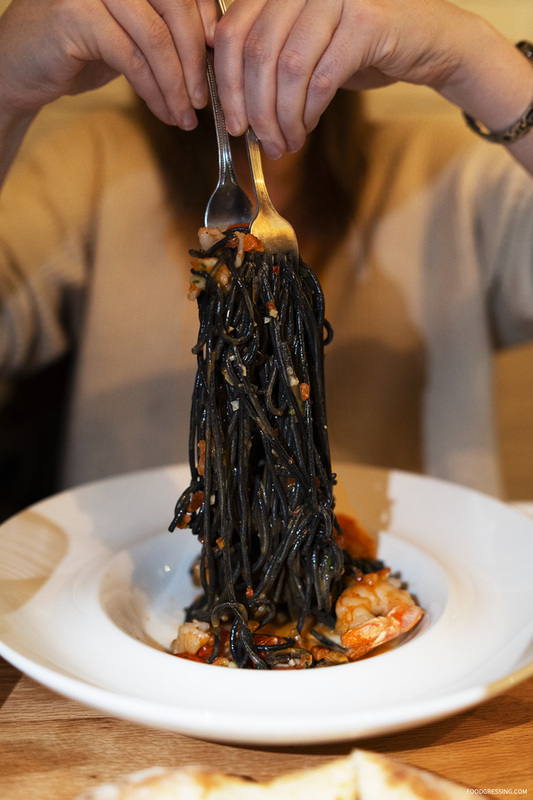 The highlight of the dinner was the pasta dish which was the daily special: seafood squid ink spaghetti. Squid ink pastas that I have tried in the pasta have mostly been not very flavorful even with other ingredients present. However, Mangia’s version was very tasty being seafood-y and a bit garlick-y. Kristina and I enjoyed the dish very much. Mangia seems to serve rustic style pizzas. 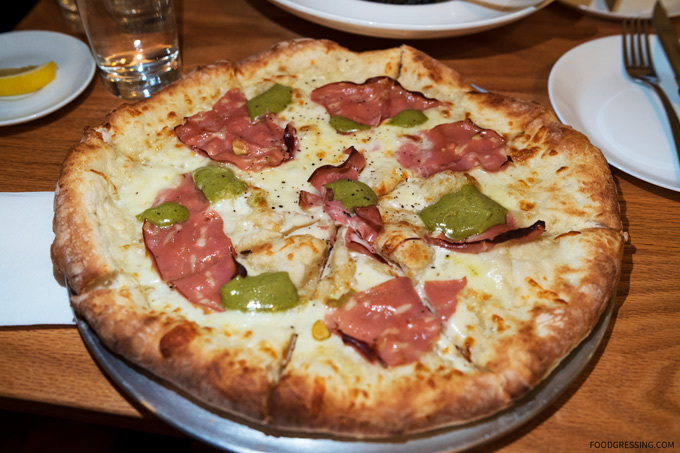 We went with the pistacchio e mortadella ($20) where the pistachio pesto is placed on the pizza after baking. It was OK for a thicker crust pizza; I personally like a thinner crust pizza but this is rustic-style after all. The pesto definitely had a more nutty pistachio flavour. 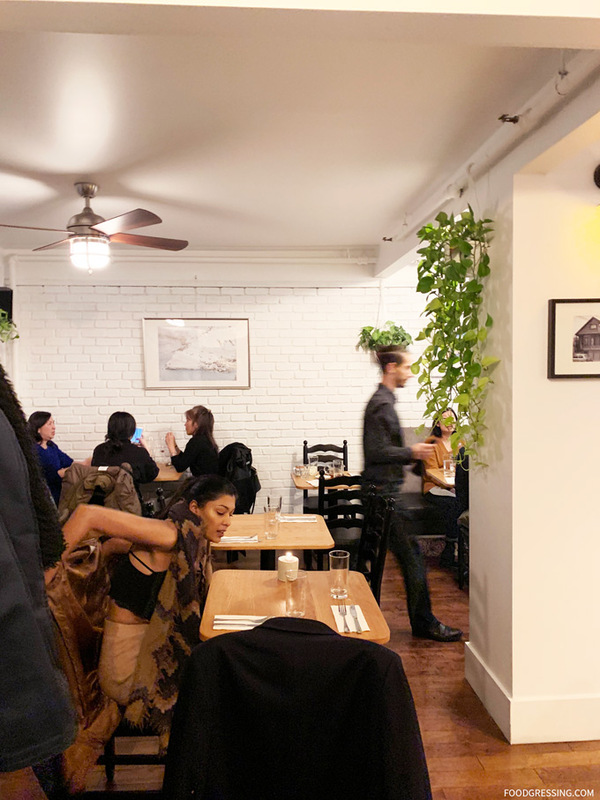 Our soft-spoken server was friendly, attentive and made us feel like home at Mangia.